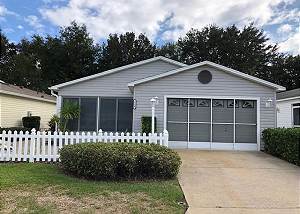 The Villages, Florida United States - Cute cozy patio villa in The Village of De La Vista West. | RE/MAX PREMIER REALTY Inc.
Two bedroom/two bath patio villa in the village of DeLaVista West. Cute and cozy patio villa with enclosed lanai on the front available for season 2020! Don't let this one get away, great location in between Lake Sumter and Spanish Springs just off of Morse Blvd. Laminate flooring, flat screen in the living area. Eat in kitchen. Flat screen in the master. Close to pools and golfing.